I’m in that lull time between my friend Jodi leaving to head back to her Cincinnati home and registration for Netroots Nation (and my hotel check-in) opening later this afternoon. I’ve been here in Pittsburgh for 4 days. Re-acclimatising myself to the American way: to US portion sizes and distances; to the accents and the attitudes; to the increasingly rowdy debates on healthcare; to the So-Co and Lime that tastes so much better this side of the Atlantic. I certainly find it easier striking up conversation with people here – whether on the plane, in the street or by the bar. Sure there’s normally an enthusiastic response to my accent. But there’s often something more: a seemingly genuine interest in what I’m doing or in an exchange about politics, culture or places. From Demo(thesnes), the Greek-American restaurant owner with an impressive foreign affairs knowledge who invited us for a drink and we ended up chatting all evening; to the guys from AmericasPower grassroots organising to promote a better image for the coal industry but willing to engage in an open and intelligent discussion on energy; to the owniter and barista at the BigDog coffee shop I’m currently sitting in talking enthusiastically about the DirectTrade coffee they serve. However, watching the cable news channels yesterday, with their reports on the heated healthcare townhalls by Obama, Senators Maskill and Specter and other Democratic politicans, the debate seems anything but civil. Protestors, hecklers, argument and intractable differences were portrayed as the norm. This looks like one hard sell for the Obama administration; especially now the tags of “Socialism” and “Obamajinedad” (yes, really) are being hurled at increasing frequency. Jodi said she had never seen such an ugly mood about a domestic policy before. There is no doubt the scare tactics by those opposing healthcare change are having an effect. Last year I’d seen “hope” and optimism as the predominant emotion. Now it seems fear and unwillingness to let go of the failing status quo are rising to pre-eminence. I think I’d forgotten how much fear – of the other, of lawsuits, of government possibly being a force for good – is part of the American psyche too. I’m hoping a couple of days with the Netroots and especially the Howard Dean healthcare townhall here at NN will be good antidotes and allow me to get a more rounded perspective on the issue. Nevertheless, my observation of the week so far: that America as a nation and Americans themselves are both far more optimistic and far more fearful than us Brits. Netroots Nation is my reason for being in what I imagined was the unglamarous city of Pittsburgh, in western Pennsylvania. But I took the opportunity to arrive 4 days early and spend the time discovering the city and hanging out with my friend Jodi. She drove up from Cincinnati and met with at the airport on Sat eve. Now it’s Wed afternoon and she’s heading back home, while I stay here for NN09. Jodi and I have good form (from my visits to Cincinnati in Oct 08 and Jan 09) in hitting the town, having fun, meeting some great people and enjoying what life throws at us. And so it proved again this time; albeit slightly hampered by Jodi still recovering from illness. Discovered ‘Dish’ – a fantastic Sicilian bar and bistro on S17th Street, just a few blocks from our guesthouse. Not everywhere you get a barista who takes a flavour or base drink you are in the mood for and then mixes some great creation to perfection. Haven’t had a better chocolate cocktail for many years! Lazy morning followed by a trip up the Duversequene Incline – a rack funicular up a steep hill overlooking downtown Pittsburgh and the surrounding riverside areas. Fantastic views. While chilling at a bar overlooking the city, met some guys from AmericasPower. They had hats saying “affordable energy” so I was intrigued as to what they were promoting. Turns out they are grassroots organisers for a campaign to promote the coal industry – clean coal, energy security, jobs and economic impact. Jeff, Tim and Opal were all experienced organisers and had been involved in the Obama and McCain campaigns. They were now going to fairs, community events, tail-gating at games etc to spread the pro-coal message and get lobbying activity underway in prep for Congress coming back. While I wasn’t sold on their pitch, it was interesting to hear a Pennsylvanian perspective on the energy debate that is quite different from the arguments in the UK. There are still serious jobs and money in coal in certain States. And the guys understood my points about investing seriosuly now in renewable energy rather than clean coal and starting a planned switch over – not (as they feared) the immediate pull-the-plug on coal we did in the early 1990s. Whatever our differences, the conversation was a pleasant one and our common enthusiasm for campaigning and political engagement shone through. Sunday evening seemed dead in downtown and in the Strip District. We ended up eating at a Hard Rock Cafe where the best thing going was the extensive cocktail menu. Unfortunately, our friendly bartender recommended against most of the concotions because they were grim. Jodi took her advice, but I’m contrary and saw it as a challenge. So I got a ‘Gargoyle’ – something involving absinthe and last ordered several months before. We ended up back near our guesthouse in the one happening part of town: Southside, and Carson Street in particular. Bar-hopping is the thing to do and that’s exactly what we did. Amongst it all, we saw some great hip hop dancing in one club and then ended up in a Polynesian bar with some folks who enjoyed my English accent and hitting on Jodi. The two guys had just finished their first shift at the mega-casino that opened up that day just beyond the downtown area. An evening with Demo – owner of cafe 1889 on Carson Street and foreign affairs specialist. We’d met him when we looked at the menu outside at lunchtime. He invited us for a beer with him later, as he was interested in chatting about politics and international relations. So that evening we wandered down (all of a block and half) and went in for a beer and ended up staying for dinner and many hours of great conversation. Here was a man who was incredibly learned (self-taught mainly) with a passion both for world politics and for hearing other people’s perspectives. We talked Africa, Middle East, EU, China (he’s married to a Chinese woman) and Obama’s impact on policy. Just as the conversation was starting to tail off, we talked Crete (his homeland and where my father has spent a lot of time recently) and were off again for another 30mins. The night was still young once we left his restaurant, and the pull of good cocktails and a friendly smile at the bar was too great … so we walked to Dish to repeat Saturday evening’s fun. We managed 3 cocktails each: not just reprises of the last creations but also new ones including a peanut butter and jelly flavoured drink. While at the bar we met a local musician who gave us CDs of his band, and two people who outdid Jodi and I for crazy antics. One’s party piece was the famous soliquay from Braveheart, complete with the right hair and booming Scots accent; the other was Danish and had perfected a hysterical laugh. A visit to the Andy Warhol museum and some time spent wandering the streets downtown. Lucky enough to be there at the right time for a fantastic outdoor live jazz concert. A sad goodbye to Jodi, as she headed back to Cincinnati. I spent much of the day in Big Dog cafe blogging, catching up on work emails and discussing Fairtrade with the owners. Back in mid June, Meghan’s documentary following my US election experiences had its first public viewing. ‘A Dollar and a Dream’ was screened as part of the America Week (sponsored by the US Embassy) at Clare Hall, Cambridge University. I only saw the film for the first time that morning … and it (and scarily I) looked different projected onto the big screen that evening. Over 50 people came for the screening. Meghan kicked off proceedings with an intro about the film and then everyone sat back to watch twenty minutes of footage which wonderfully captures the mood of America the week before the election. The film is much less about politics and the election, and much more about the interaction between me and Americans, and a glimpse of what life was like campaigning in the American suburbs. My role may initially have been as chief protaganist, but thankfully I am certainly not the star of the show: it is the people I meet along the way who are (as well as Meghan, who did so much running with heavy camera equipment to try to keep up with me and also skilfully pulls together all the disparate footage to weave a coherent and meaningful narrative as all good story-tellers do). The reaction from the audience was generally very positive and also included some good feedback which will help make the final version even better. After people had had a chance to question Meghan, I was brought to the front to sit on a panel of eminent academics and commentators to discuss ‘Obama: 5 months on’. Fascinating contributions from the other panellists, especially a guy who had been a senior McCain foreign policy advisor. Thanks to sponsorship, there was a drinks reception afterwards. American wines of course! But also a chance for people to look around the college’s new temporary exhibition: a display of Obama and US election memorabilia collected by yours truly. The organiser did a superb job of displaying a selection of my buttons, trinkets, flags, posters, newspapers and more collected from my various trips to the States. Below is the text of a letter sent on 29 May by Helen Cross to all Electoral Reform Society members. The letter was in support of the resolution she submitted to the ERS AGM ‘building blocks for a stronger campaign’ (full text here)(or pdf) The mailing also included this reponse form to send back to Andrew Burns, chair of ERS. Please print off this form, complete it and return to ERS, Thomas Hare House, 6 Chancel Street, London SE1 0UU. Many thanks. I have taken the unusual step of writing to you, to ask you to support the resolution that I have put to the Society’s Annual Meeting, which calls for the Society to build a robust and high-profile campaign for electoral reform. Now is a critical time for all supporters of electoral reform. The recent political upheaval in the wake of the MPs’ expenses scandal has presented us with a golden opportunity to press home the message that only a change in the voting system can truly increase accountability and put power back into the hands of the people. The Society has taken a lead role in building a coalition of political organisations and other groups to seize upon the public mood, by pressing for a referendum on a change to the voting system to be held on the same day as the next general election. large numbers of their constituents. We need activists not only to create widespread support for electoral reform, but also to take the fight to our opponents, tackling the myths and misconceptions about proportional representation wherever we find them. We also need to maintain a broader network of supporters, who may take a less active role in the day to day campaigning, but who can nevertheless be called upon to stand up and be counted at those crucial points in the campaign when we need them the most. Amongst our membership, we have many passionate and experienced advocates of STV and reform in general. Whilst their individual efforts are commendable, how much more effective would all their work be if they had the benefit of support, co-ordination and above all strong leadership from the centre? its aims. It is precisely the type of people that we are targeting in our outreach programmes (youth and students, women’s groups and community activists) who are likely to be the next wave of electoral reform supporters and campaigners. Outreach work and activism are vital in achieving widespread public support for electoral reform, which we will need to win a referendum. by the Annual Meeting, but that the Council understands the strength of support for the principles behind the resolution. For this reason I am also asking you to write to Andrew Burns, Chair of the Electoral Reform Society Council, to let him know your views on this issue. I firmly believe that the measures set out in the resolution will give the Society the best possible chance of achieving its primary objective of securing the use of STV for all public elections in the United Kingdom. It goes without saying, that all the steps proposed by the resolution should be taken with this object in mind. This isn’t about the US mid-term elections, or a party’s campaign at the next UK General Election. This is about the other area of my life: electoral reform. Below is the resolution to the ERS Annual Meeting 2009 that I am keen to promote and get people supporting and voting through. To vote yes to this, you need to be a member of the Society. Join by 26 May (if you aren’t already a member) in order to be able to vote. This meeting welcomes the excellent outreach and campaigning work already being done by the Society’s staff to advance the campaign for electoral reform amongst new audiences. This meeting notes the innovative event in Birmingham in May, piloting new ways for the Society to engage with community groups and politically-active organisations and individuals. This meeting commends the work being done in co-operation with Make Votes Count to recruit and train activists to campaign for a fairer voting system. This meeting recognises the important role played by electoral reform supporters, in growing the campaign throughout the United Kingdom so effective pressure can be applied at Westminster. This meeting commends the experience, determination and enthusiasm that supporters have demonstrated in taking the case for electoral reform to many different audiences. 1)	continuing to work closely with Make Votes Count on areas of common interest, in order to benefit from the strengths and resources of both organisations. 2)	supporting and providing materials for a network of activists who will lead grassroots campaigning activity in every constituency in the United Kingdom. 3)	developing the capacity (whether itself, or through organisations such as Make Votes Count) for greater public campaigning, focused on the case against first past the post and the positives of changing the system, and also to more forcefully take on our opponents and challenge the myths about proportional representation. 4)	extending the Society’s work with new audiences, including increased production of appropriate resources and campaigning materials. 5)	taking all necessary steps to ensure that the Society is well-placed to fight and win a national referendum should the opportunity arise. I took part in the Put People First march last Saturday. That was the big trade union and NGO (non-profit) ‘fluffy’ march through central London in advance of the G20; trying to push job creation, different ways of tackling the financial crisis apart from bailouts, and put climate change higher up the agenda. Tens of thousands of people; carnival-atmosphere; lots of banners, placards, creative costumers and marching bands. I was with a group of Manchester University students – photos here. Some positive London-based media coverage in the run up to the event; but by Sunday the focus was more back on the G20 leaders and the summit logistics. I’ve been working flat out at work because of a management committee meeting, so haven’t been able to saviour the protests or the streets of London yesterday or today. Am I selling out by focusing my attention on voter education and promoting participation in electoral politics, specifically the European Parliamentary elections coming up in June? I would argue not; but some may choose to disagree. I have had plenty of friends and even some colleagues out there these past two days. Certainly Wednesday’s ‘climate camp’ seems to have been a colourful, peaceful and productive way of demonstrating. Not sure of the rest. One friend in the thick of it sent me a text this morning – responding to my wish that the protests have some impact – saying: “not sure anyone had thought of impacts … or much of anything”. And the traditional media inevitably was focusing on the sporadic (and very minimal) outbursts of violence and property destruction. I’ve seen far worse though – both here in London one MayDay and particularly, in my Summit-hopping days, at the G8 in Genoa. I did happily leave my office yesterday evening. Not for protesting, but for Obama welcoming duties. I joined the fantastic ‘Brits for Barack’ group and members of Democrats Abroad lining parts of the Mall and Parliament area awaiting Obama’s arrival for dinner with Gordon Brown. I took my place outside the famous gates to Downing Street and had an enjoyable few hours. We spotted Michelle, but the man himself entered underground and never came out to give us a wave. Those outlets included ABC News, The New York Daily News, Time Out, France 2, Nippon TV and German TV. And yes, there was me getting in on the act too. I was dressed for the part: wearing my inauguration beanie; a selection of buttons (including a ViaDelia special); holding a ‘Vote Today’ door-hanger left over from my election day efforts in Cincinnati; and of course waving an American flag that I had been handed on the Mall for the inauguration. In fact the whole thing was like re-living the great campaign rally days (minus the huge crowds); especially as I was in ‘blogger’ mode too and interviewed various of the Obama-philes. And the crowning glory: two North Carolinans had flown across to London especially to sell Obama memorabilia. Awesome! Though because there were no big public Obama events, business was hard-going for them. Over the weekend I’ll write up the interviews and post pics here on my blog. Overall, the atmosphere in London is not what I had envisaged some months back, when the G20 and Obama’s visit was first announced. Where were the cheering crowds; the Obama-mania; the big public speech (our own Berlin moment) or at least a ‘rope-line’ meet-n-greet? Yes, the political and economic climate is quite different than last November, especially here in the UK where the effects of the global downturn have been felt later than across the Atlantic. Yes, there are protests and security concerns to contend with. But I really feel that Obama – and his advisors – have missed a trick. There are plenty of people here still fervent fans; or just wanting a glimpse of the President in person. There would have been the uptake for some public event or speech, especially I believe within London’s large black and ethnic minority community. Wednesday morning I went to the launch of the Hansard Society’s ‘Audit of Political Engagement 2008’. My intern Laura has written on our work blog about the meeting and gives more details about the report, including links to a summary and a pdf copy for download. The Hansard Society do this report annually and this time they specifically looked into whether there was an ‘Obama Effect’ in the UK – in terms of interest in, knowledge of and belief in the efficacy of politics and political activity. In the population as a whole, there was no real change in any of these indices; but amongst the minority ethnic communities there were significant increases in engagement levels and the feeling that politics mattered and could bring change. So was an observable Obama effect. However we shouldn’t get too carried away – this is from a low base; and is still on levels below the population as a whole. And to me what the Audit showed was that “we have failed” – “we” as in all of us involved in politics in all its form. For we have failed to capitalise on the amazing spectacle and symbolism of Obama’s campaign and victory and turn that into reasons why British people should care about British electoral politics and get involved with Politics with a big P. I’m not sure whether the events of the past week – whether the protests or what went on inside the G20 summit – will have rectified that. The challenge is to find some way of doing so. Online, but who is listening? Saturday you had three major political conferences going on in London at the same time: Convention on Modern Liberty (civil liberties), Six Billion Ways (international social justice campaigns) and Progress’s Labour 2.0 Campaigning for the Net Generation. I went to that latter one. It was a useful event, and I came out having picked up some good online campaigning tips. But I came out frustrated as well as energised. And talking to colleagues this morning who attended the other two conferences, I even more keenly feel that. For the energy – the popular momentum and interest and activism – is not in the Labour party, or parties in general; it is outside. Missing from Labour2.0 was virtually any meaningful discussion and acknowledgement of (i) how Labour engages with a broader progressive coalition and (ii) how Labour engages with and involves all those millions of single-issue pressure group activists, and civic society in general. Honourable exceptions to this silence were Nick Anstead, James Crabtree, BorisWatch (in the London context). Special mention also of Stella Creasy, who is revolutionary in her desire to open up the conversation rather than close it off via the traditional canvasser’s first question “do you support / would you consider voting for Labour”. In terms of blogging in particular but also online communications more generally, there seemed a real disconnect between the positive, inspiring e-campaigning messages we had heard in the morning sessions and what was discussed in the afternoon sessions. There seemed to be a pre-occupation with beating Guido / Iain Dale / ConservativeHome at their own game. Most people were taking a very narrow view of politics: treating it as high politics and what gets done in town halls, government departments and at Westminster. Especially when talking about the lack of women and alternate voices in the blogosphere, there was some discussion of style of politics – its viciousness, macho-ism, male-dominated nature – but a deeply disappointing acceptance from most people that that was the way things were. No real voices in the room for change or looking at what might have caused our negative political culture. All of it brought home to me how we have a ‘First Past the Post’ (winner takes all) blogosphere!!! Where is the pluralism? Where is the democracy? Where is the inclusivity? Where are the women? Much of this is about the way we do politics and our political culture. And it does depress me that where as a year or two ago this was much more talked about within the Labour party, the fight no longer seems to be there to bring politics into the 21st century. Because the danger is that we might use all these new shiny technologies and ways of communicating, but fewer and fewer people will actually be listening to us. 	Lowering barrier to organisation and campaigning, and at almost zero cost. 	Content –> real relationships: between campaign and supporters; between supporters. 	Importance of personal stories, “voices” and authenticity. 	Community organising is about making connections, not politics. politics and they want more; want to be involved and be part of it. Labour was a pluralistic institution when it was set up in 1900s – a federation of affliates, a network, a combination of values. Needs to remember that and operate like that again – that will be how it maximises its potential – on and offline – in this new era. Need compelling narratives. Campaigning beyond boundaries. Channel anger into doing ‘stuff’ for you and bringing them to the table. 	[paraphrasing] how do you build the relationships in safe Labour seats? 	Systematic collection of email addresses. For email lists are the important thing. 	Test: is this email useful enough for forwarding on? 	Not about closing down the conversation – hence not about asking them are they Labour members or will they vote Labour. That comes much later on in the process. People trust brands less and people more. Speed matters. Don’t be risk adverse. Morph ideas don’t dicard them. Technology at home better than at work for many people. Google US polling station maps and outreach. Hoping to bring that here for next general election. Google want more ideas on connecting politics and google technologies. Web2.0 = user-generated content; user-organised content; personalisation of info experience. innovations of Labour’s online offering. Labour List – “the clue is in the name … we are Labour .. We are ultimately about supporting the government” (on every issue?”) LabourList is not a campaigning site. It is a community of Labour-minded people. Campaigning is for Labour party site. blogging as journalism or campaigning? Congrats to those long listed for the Orwell prize for blogging. I put my writings on this blog up for award, but didn’t realistically expect to be chosen. But I was slightly disappointed by the blogs chosen. Not for their quality, but for the limited range. Quite a few of the long listed entries were blogs written by professional journalists and for their employers – Mark Easton of the BBC, Andrew Sparrow of Guardian Unlimited – or by professional political operatives – Iain Dale. There were relatively few selected written by amateurs or rather citizen journalists. There were few that were about reaching out beyond an already interested audience. Blogs can serve many functions, be written by all types of people and for many purposes. And all are valid. But when it comes to ‘political’ blogs – and I take that in its wider sense – it is even more important that there are some people out there who are not just reaching out to the already converted or the already interested, but instead make political discussions and engagement accessible to a wider audience. And not just accessible – participatory, inclusive and serving a wider democratic ’good’. That function can be served by journalists. It can be served by politicians and party political sites. But it also needs to be filled by ‘ordinary’ people who show their passions and interests and who it is easier to relate to. A more personal connection if you will. A good blog – or any form of online communication – is not just about getting your piece on the news, or getting one over the opposition or being well known in the Westminster Village. There is an alternative, esp suited for the progressive sphere -community blogging. Learning the lessons from the Obama campaign may be a cliché, but this is one that isn’t getting picked up in the way I’d hoped. Spreading something “block-by-block”, or by word of mouth works precisely because you are speaking to people who know you (or have some connection with you) and a reason to trust or at least listen to you. So perhaps some of the most effect online political campaigning can be done by people setting up their own blogs or using their facebook or twitter accounts – which they already use to connect with their own family, friends and networks – to now communicate more political messages. Approaches to online campaigning and social networks are another area which the political parties are struggling to get to grips with. Labourlist seems to take a very top-down, loyalist approach; and is serving the purpose of a mouthpiece for high level party views and debate. At first I thought John Prescott’s site was a similar beast, but feedback from friends suggests that – because of the personal nature of the site and John fronting it – it actually works as something more. As a campaigning site for Labour activists. But what Labour has not yet got; what we on the progressive side of politics have not yet got is something which is not just a home for party activists and partisans, but is something more, a place where single issue campaigners and the mass of social justice activists can feel comfortable. I write this on my way to Labour 2.0 ‘campaigning for the net generation’ conference. I suspect I will get both excited and frustrated in equal measure by today’s speeches and discussions, as some of the above is addressed and other aspects not. 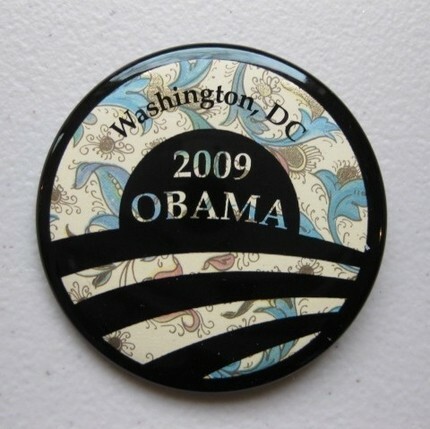 For the past month I have been proudly wearing an “I was there … Obama inauguration” button [badge] on my jacket. I’ve worn a variety of Obama buttons and hats since attending the Convention back last August. That action encapsulates possibly the number one lesson from the US elections and the Obama campaign I have taken away with me: the importance of “visibility”. During a campaign in the UK, it is possible to go through whole constituencies and see barely a sign that an election is going on. Not in America, or at least not this time. Posters, banners, yard-signs, bumper stickers, people holding up placards by the side of the road, clothing – so many ways that showed (i) an election was happening (ii) the result / politics mattered (iii) people wanted to be identified supporting a particular candidate or party … and spread those messages to others in the neighbourhood. Wearing a campaign button is one of the cheapest, easiest and most effective ways to be ‘visible’. Without any further effort, your message is seen by whoever you pass by on the street, sit opposite on public transport, or have a conversation with. But more than that – as I know from my experiences in the US and when wearing Obama buttons here – it can be a great conversation-starter, and way of getting strangers, or friends, interacting about something political. And what may start as purely an act of showing your identity, or seemingly doing the bare minimum to support a cause, can actually be the first step along a path to greater activism. The more you share your story (whether to other supporters or to those that question your affiliation), often the stronger that connection gets; and the more likely you are to meet and feel motivated to join with other campaigners. What does all this have to do with the ‘We the People’ inaugural ball you may ask? Well, there that evening I met someone who absolutely epitomises the spirit and the power of visibility, and have been raving about her – and her work – ever since. Step forward, Delia Paine – aka “the button woman”, aka ViaDelia. When I met Delia she was standing by a long table full of brightly-coloured and shiny buttons emblazoned with the words “Hope Wins”, “Yes We Did”, “44th President, Barack Obama”, or simply “Obama”. Here on display and very much on sale to the queues of inquistive and excited ball-goers was her artwork; her creations. 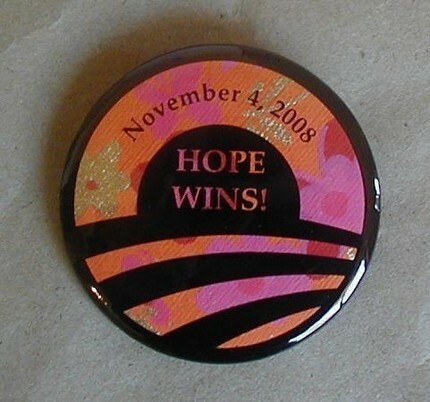 These were no ordinary Obama buttons. Each one was handmade, from a variety of decorative paper, foils and other materials. Special and unique and great mementos, definitely. But there was something more; and as we talked and I learnt about the story of the buttons, the journey – both geographic and political – that the buttons had taken her on, unfolded. Delia is an artist based in Bend, Oregon, and had been making and selling arts and crafts for many years. She did commissions – for one-off events or personal celebrations, nothing political – and made buttons promoting her local community. 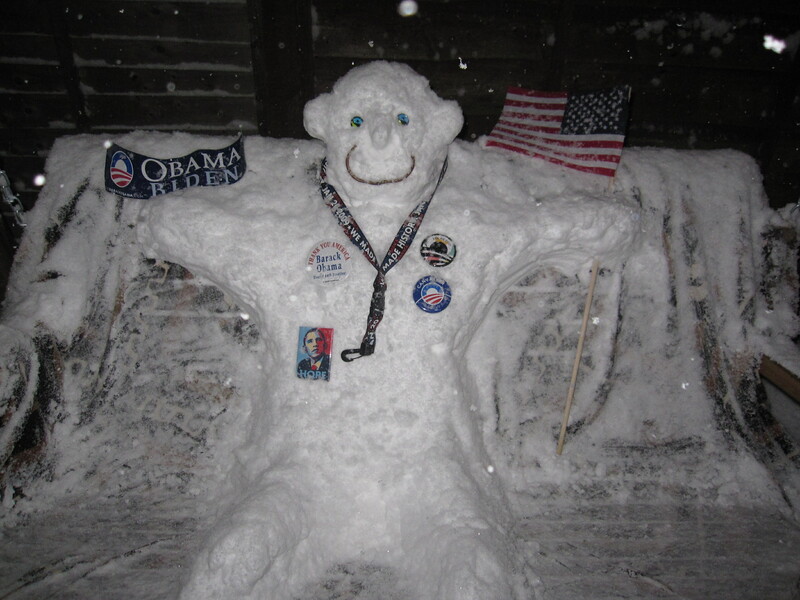 Then in summer 2008 she was approached by some local Obama campaigners who asked if she could use the same technique for producing some buttons in support of Obama. A few were made and they proved extremely popular … and so production continued and quickly increased. More and more people were seeing their neighbours or fellow activists wearing them, and wanting their own. Soon the buttons were the top-selling item at the local Democratic campaign HQ. And the buttons served a dual purpose, for they proved to be a great fundraising tool for the party too. Word spread and Obama and Democratic campaign offices across the States of Oregan, Washington and California wanted to be part of it and bought thousands of buttons to sell on to supporters. Together these offices raised over $20,000 simply from the sale of Delia’s buttons between August and November. Even before the buttons had gone region-wide, Delia spotted an opportunity to show her artwork to a larger audience. She took 1000 Obama buttons to Denver, to the Democratic Convention. Because this was very much a last-minute decision, all the proper pitches and stalls on the 16th Street Mall had been taken already. But she set herself up in a tiny spot anyway and sure enough people did find her. And so did the media. In 4 days she sold $10,000 worth of buttons; and all the media attention, word of mouth by delegates and of course sightings on people’s clothes (including the likes of Speaker Nancy Pelosi) brought orders for thousands more buttons. And so what started out as one extra design amongst the many she did, suddenly became Delia’s full-time occupation. And not just til November. There was no drop-off after the election victory as she’d initially expected, because demand for her special celebratory editions far exceeded anything she imagined. 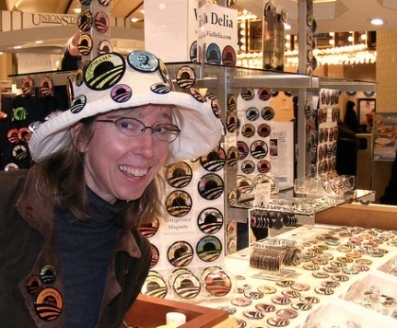 And so – to further take advantage of this continued demand – she decided to up sticks with her family and move for the month of January from Oregon to Washington DC, and rent a shop in Union Station selling her whole range of Obama buttons, magnets and key chains. One of the organisers of the ‘We the People Gala’ spotted her shop and was so impressed that they invited her along to the ball to showcase her work there. And that’s how I came to be talking to Delia. The story of the buttons is inspiring enough. And they are beautiful works of art. I have proudly worn one of the ones I bought from her not just at political meetings but at more formal social events over the past month. My colleague Lewis spotted a woman on a bus in London wearing one and they had a good conversation about the inauguration and Delia’s artwork. My snowman even sported a Delia button. Yet what really made my encounter so special and affirming wasn’t the buttons, but Delia herself. She is skilled and creative not only in her art, but in marketing it; and does so in a very engaging and personable way. As we talked, it became clear that her passion for selling her merchandise was more than that of a salesperson. She believed in the Obama campaign and was happy to be doing something to support it. Yet this was the same woman who had already told me she wasn’t political and had never been so. 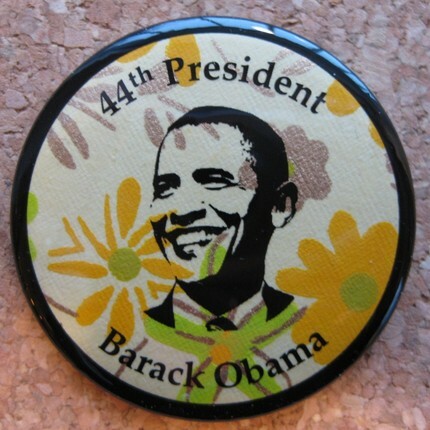 In fact it had taken her 3 weeks after producing the first Obama buttons to feel comfortable in actually modelling one herself and longer to wear it often in public. Something had happened to her, even without her really noticing it … she had become politicised. This transformation become complete to me – though I had to point it out and encourage her to recognise it in herself – in her response to my favourite question: “what’s next?”. Delia said that many people had approached her with particular commissions and she was now asking herself “can I sell this and still feel good about it? If I can’t, then the answer is no”. That to me is an awesome example of someone become more politically conscious and active. And as if to prove it, the commission she accepted and designs she has been selling since then are in support of marriage equality and the protection of gay rights – as part of the campaigning and solidarity activity going on in the wake of the yes vote to California’s Proposition 8 banning gay weddings. The story of Delia and her buttons underlines how elections and campaigning needn’t be a dull, monotone business; and that being visible (in this case through making or wearing a button) can be a powerful and effective campaign tool and a change agent. And that latter bit gets to the very heart of why I care about politics and getting more people involved in the democratic process. NB. 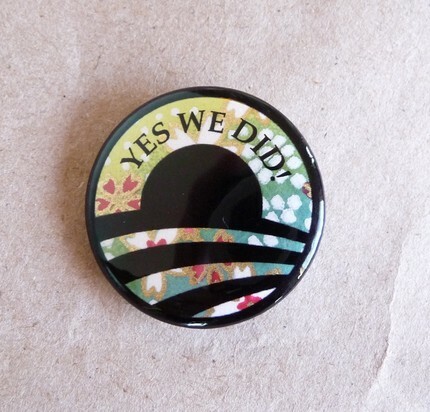 There are more photos of the Obama buttons on Delia’s website, and you can buy a selection of her buttons via her online shop. OFA 2.0 – the future? One answer to the question “what’s next?” for all the activists and grassroots networks of the Obama election campaign has just had its first outing. Across the US last weekend several thousand “stimulus parties” were held. These were structured but self-organised events aimed not just at selling the Obama stimulus package but educating, getting constructive feedback, letting people feel they were taking some ownership of the package and the process, and encouraging them to come up with elements they could advocate or take action on. Welcome to the world of ‘Organizing for America’ – the Democrat party and Obama’s bold, ground-breaking and potentially hugely politically significant new project. 538’s Sean gives a brilliant first-hand account of what one of these events in Bowie, Maryland was like. Of course not all the stimulus parties were as well attended or productive as that one, and the media has quite happily picked up on some of the less successful cases. And it will be interesting to see how much of the talk then gets translated into action(s). But as a first-try of a model for popular engagement in policy and sustaining grassroots activism, it has a lot going for it. And the word is resources and field staff are going to be committed to it in near 50 states, so there’s definitely more to come. Plus as long as you have passionate people – the like of which Sean interviewed and are quoted below – involved, I am going to be following what happens.